In a divided multicultural world, religious values which uphold spirit of peace and harmony must be promoted and implemented to maintain unity between community to avoid chaos and violence conflict among each other. Debates and discussions related to religiosity must always be carried out so that there will be many new concepts that could reinforce notions of religiosity as an adhesive of social cohesion in society. 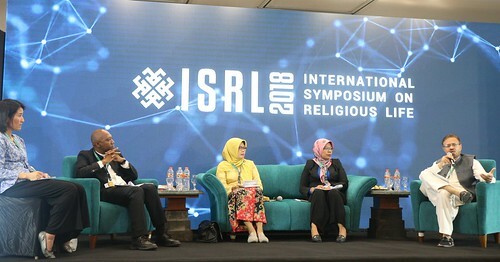 Based on this momentum, ICRS and Indonesia’s Ministry of Religious Affairs organized International Symposium on Religious Life (ISRL) in Yogyakarta, 6-9 November 2018. ISRL is a program carried out every two years and held by Indonesia’s Ministry of Religious Affairs. This year ISRL’s committee invited speakers and paper presenters from many countries such as Japan, Pakistan, Malaysia, Australia, United States, Switzerland, Nigeria, Singapore and Macedonia. International Symposium on Religious Life (ISRL 2018) activity is inaugurated by Indonesia’s Minister of Religious Affairs, Drs. H. Lukman Hakim Saifuddin. In his opening remarks he said that we are supposed to encourage the establishment of the transmission of religious knowledge through the medium of cultural products so that the development of both religion and culture may go hand in hand. Negotiating religion with culture does not mean we give up the basic principles of the creed of every religion in the name of culture. In the same token, reconciling culture and religion is not always the same with confining the cultural creativity and expression that we have. Both the cultural and religious activities must develop and live together in harmony and get along together in favor of taking care the wholeness of Indonesian society which is very plural and multicultural. He also emphasized that number of speakers in this symposium will present and discuss research findings on the context of the relation between religion and culture. “I believe that those topics are undoubtedly chatting on the manifestation of religion and culture relationship empirically, either in the context religious life in Indonesia, Southeast Asia, and Asia and even in the context religious society across the globe. Part of the speakers utilize many approaches ranging from sociology, anthropology, classical Islam, comparative religion, philanthropy contemporary Islamic studies and among others”, he said. Through debates and discussions in this symposium hopefully will bring new ideas and notions for religion and culture relationship which is compatible with the construct of the Indonesian society where religion is seen as vital on how to behave and be ethical. The attitude of moderation in religion need to be prioritized by every religious adherent in order to avoid fragmentation and radicalization among religious community. “I hope that we can promote this kind of identity and characterization of religious harmony as well as social agreements in order to accommodate religious-based communal rights on one the hand and fulfill individual rights on the other. Religious harmony can be fulfilled only when the religious freedom is based on the attitudes of respecting the communal values and prioritizing the communal rights for the people based on the religion they believe. Hopefully, this Symposium will present real examples in society that illustrate the embodiment of religious values in creating models of religious harmony and moderation within religion” Mr. Lukman Hakim Saifuddin said.